Every year from April to July is the driest period in Ninh Thuan, turning this southern central province into a mini desert. Local farmers struggle to cover this desert land with the green of development. Although the dry season just started, plants in Dong Day and Tham Du villages (Phuoc Trung commune, Bac Ai district) almost died of drought except for cacti grown as fences to separate fields. In early 2018, Ninh Thuan suffered from low rainfall and severe heat, drying all irrigation reservoirs. The province seriously lacked water for cultivation and animal breeding. Ensuring sufficient food and water for sheep in the dry season is a challenge for locals. Ninh Thuan has around 150,000 animal raising households with a total of over 112,000 cows, 137,000 goats and 160,000 sheep. 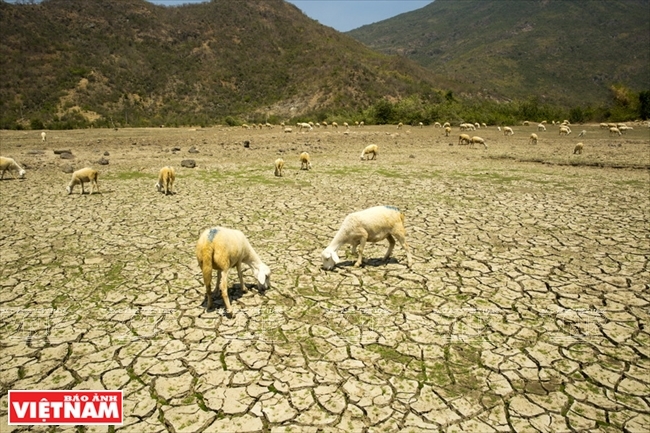 “The drought season has just started but nearly a hundred sheep have died because of a shortage of food and water,” Tran Cao Hoa, the owner of a herd of 1,000 sheep, said bitterly. Hoa only hoped that his sheep raising business could break even. 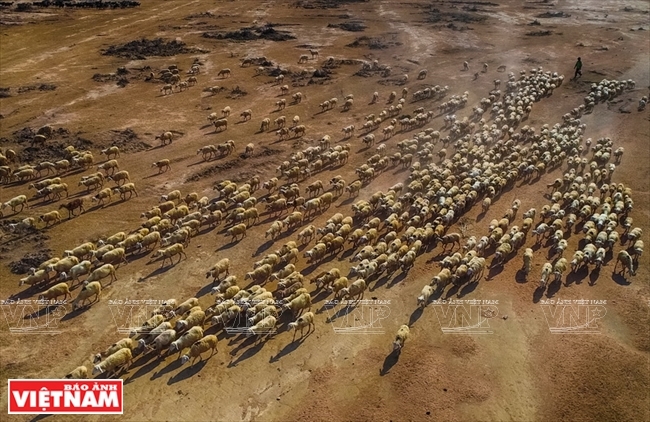 These days, if visiting Bac Ai, Thuan Nam and Thuan Bac districts – the center of drought in Ninh Thuan, one can easily find skinny sheep and cows patiently chewing dried grass or straw to survive before the rainy season comes. “Tending sheep in this season is hard. 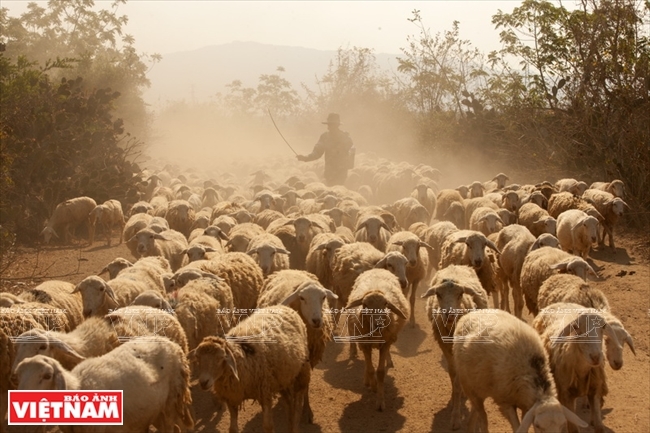 I have to chase them to valleys some 10 km away in hope of finding food for them,” said Le Thi Thu Linh who is hired to tend nearly 400 sheep in Dong Day village. In the context of global climate change, Ninh Thuan has recently changed its agricultural production model adaptable to drought by developing shrimp raising on sand. 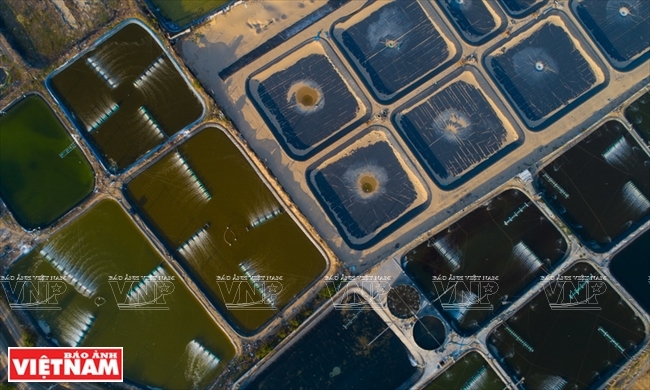 Along the coast in Phuoc Dinh commune, Ninh Phuoc district, are shrimp-raising ponds on the white sand. The province now has some 900 hectares of shrimp culture on sand, mostly in Phuoc Dinh commune. Vo Thanh Vu from Son Hai village owns one of the largest shrimp farms in the area. His 3.5-hectare farm is covered with nets to reduce light while putting canvas sheets on the ground to keep water. The farm has modern systems of water fans, feeding, environmental monitoring and wastewater treatment. 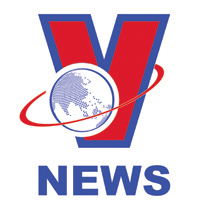 “Hi-tech shrimp farming on sand requires a big investment,” Vu said, citing his investment of 5 billion dong (roughly 22,700 US dollars) for 12 shrimp raising ponds. 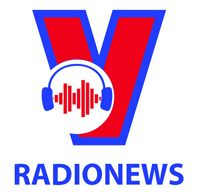 In the first two crops, Vu earned 2.5 billion dong (around 11,300 US dollars). He hoped to recover all the capital after the third crop. From shrimp farms in Phuoc Dinh commune, we left for Nam Cuong sandy hills in Tuan Tu village (An Hai commune, Ninh Phuoc district), the asparagus growing area of the Cham people. We dropped at the largest asparagus farm in the area owned by Hung Ky, known in the area for making high profits from asparagus growing. 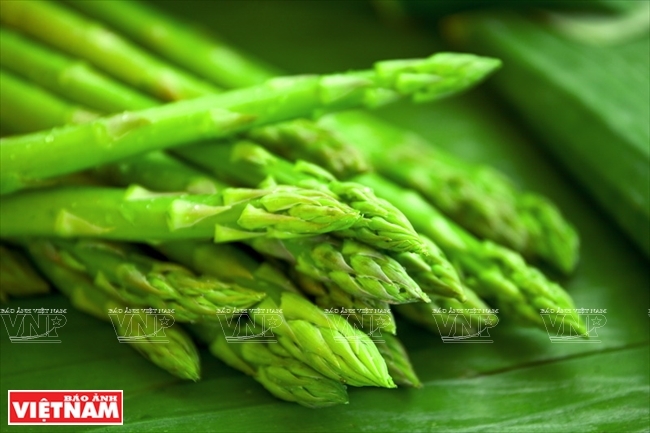 In 2012, Ky borrowed money to invest in growing 2.4 hectares of asparagus with the spray irrigation method as he found that this expensive vegetable is suitable to the hot climate and dry soil. Ky now earns around 1 million dong (45 US dollars) daily. 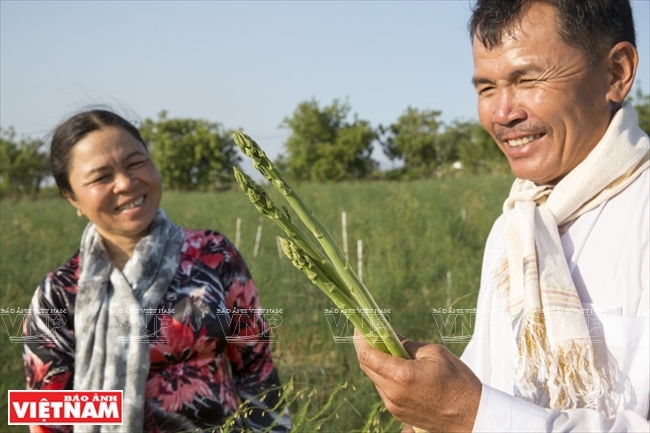 Not far away from Hung Ky’s farm is a two-hectare asparagus farm of the Linh Dan Company. 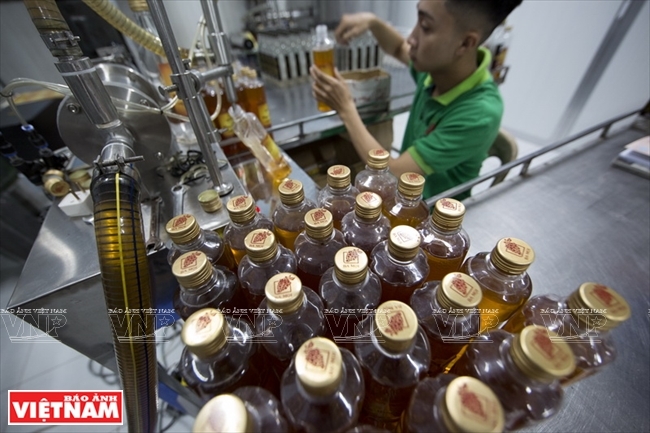 The company’s key products of fresh asparagus and asparagus tea, grown under VietGAP standards, are now on the shelves of most supermarkets and shops in big cities. Linh Dan also supplies seedlings, transfers growing technology, and ensures sale outlets for asparagus farmers. Many other farming models have also been applied in Ninh Thuan such as growing grape seaweed in Khanh Hai township, canvas sheet-covered salt making in Ninh Hai district, growing short-term pink grape crops in Thai An, which earn farmers encouraging profits. Ninh Thuan people have gradually overcome the severity of natural conditions on their dry land to survive and make money. 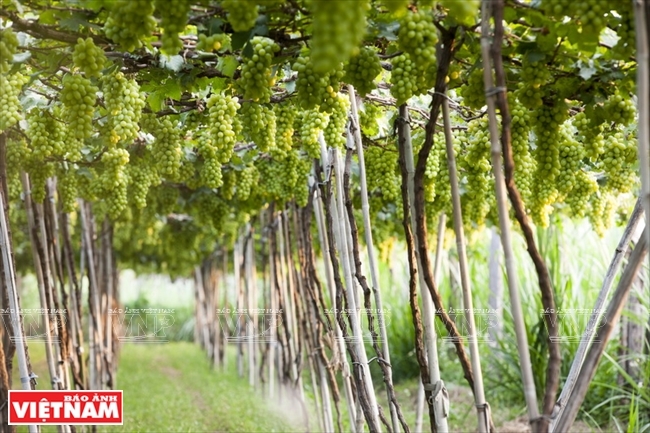 Growing grapes in Ninh Thuan not only adds value to grape-based products but offers an attractive tourist service. 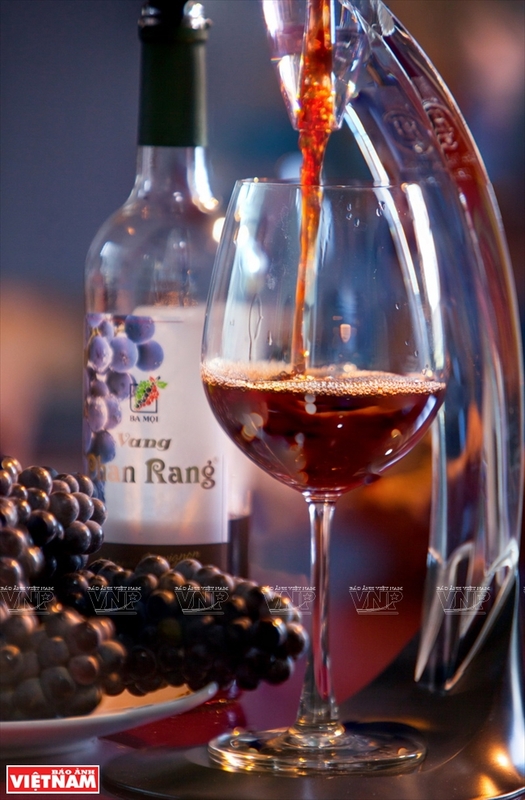 Ba Moi, the most famous vineyard in Ninh Thuan, is an important destination on any tour to Ninh Thuan. With two hectares of grapes and apples, the farm receives an average of 1,000 visitors a month. Apart from Ba Moi vineyard, Thai An village has recently emerged as a tourist attraction in Ninh Thuan. Located on Vietnam’s most beautiful coastal route - road 702 which runs through Nui Chua National Park straight to Vinh Hy bay, Thai An village lures visitors with fresh green vineyards. We went to Lang Phuong garden crowded with tourists. 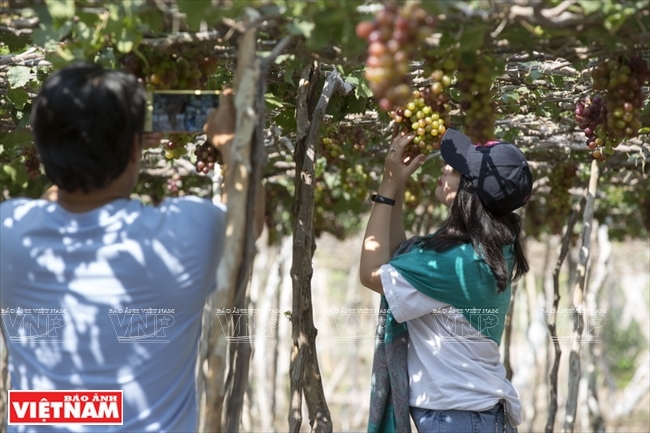 “Here, visitors can enjoy grapes fresh from the vines and buy the fruit picked by themselves”, said Nguyen Thi Phuong, the owner of this garden. 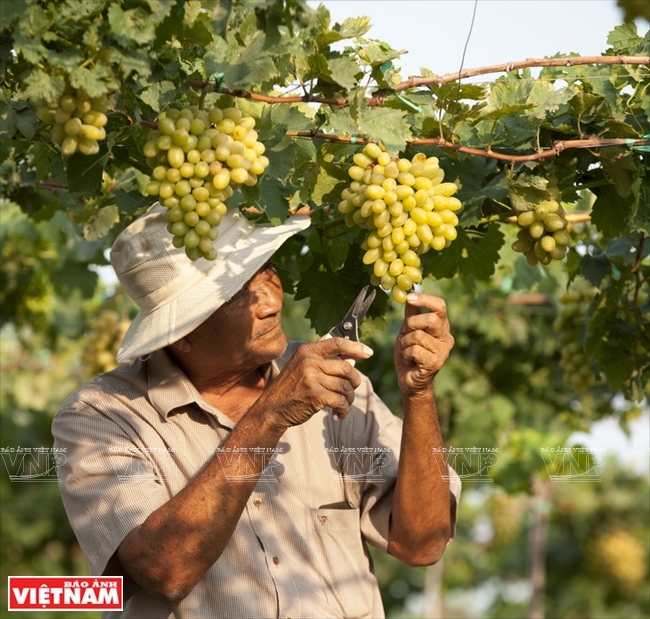 Vinh Hai commune now has around 400 vineyards with a total area of 180 hectares, harvesting three crops a year, each with a yield of between seven and eight tons per hectare, according to Nguyen Hai Dang, vice chairman of Vinh Hai People’s Committee. 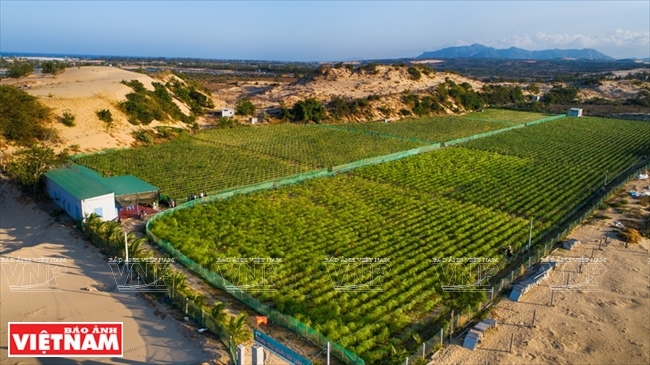 The commune has trained vineyard owners in English and tourist services to best serve visitors.Vineyards are currently an attractive destination for visitors on their journey to explore Ninh Thuan.